One of the most powerful princes in Saudi Arabia, the grandson of the late King Abdulaziz, whose name was not disclosed, distributed in a number of British publications, including the newspaper The Guardian, two letters from senior members of the royal family, who are calling for the palace coup in Riyadh. "We can not stop the outflow of capital, political instability and military threats, if not change the method of decision-making, even if it has to change the King" - the message says. Given the reputation of the publication, the authenticity of the letters no doubt. It is obvious that the situation in the ruling Al Saud family has reached such intensity that the conspiracy against the present king Salman and his entourage probably moved to the stage of practical training. The roots of the discontent in the royal family sprouted immediately after the change of monarch, in January this year, when the very next day after the death of King Abdullah, a fierce battle between two clans of Al Saud for the succession. Salman won the clan, which at the last moment managed to prevent the change of the will of a dying monarch to take his place. To consolidate his power, he broke the existing system of inheritance of power, according to which the next king becomes a son, a brother of the previous monarch. Crown Prince Salman did not Mukrina brother and his nephew, 56-year-old Mohammed bin Nayef. At the same time deputy "successor" (the second candidate for the throne) - his son Muhammad ibn Salman, which documents 35 years old, but in reality - no more than 30. Both princes the king gave a giant even by Saudi standards authority. Thus in Riyadh I have developed a very narrow, but extremely powerful small group management: all internal affairs has been the king's nephew, foreign and defense policy headed by his son, and at the head of the "pyramid" is the monarch - the old, the weak and suffering from dementia. His recent performances show more burgeoning senile king. All the other princes of Al Saud family, who had power under former head of state, proved to be excluded from the government. Key positions are now occupied by only close to the ruling "troika", and all power and economic ministries are under their complete control. This led to intra-crisis, as many princes from other clans Al Saud have appeared irrelevant. And to fill the pockets of petrodollars in the absolute monarchy, the oil may be only those who are "sitting" on the cash flow or have "access to the body." That is the title of a prince of royal blood has ceased to generate revenues. Although, of course, not only vnutriklanovaya struggle led to this situation. In many respects the crisis caused by the difficult and the increasingly difficult economic situation in the KSA. Firstly, the inauguration of the new king in January this year It noted a huge waste: the money from the state budget on the "mood of loyalty" were civil servants, military officials, police, students and even employees of municipal services. It cost the treasury billions of dollars. Secondly, the Saudi army of more than six months is a large-scale war in neighboring Yemen, as well as support to crumble Egyptian regime Alsisi helping Syrian rebels, Libyan Islamists and almost always is a mystery, a costly war against Iran. All this requires a huge financial cost. The longer the Saudi intervention in Yemen and Syria, the greater the risk that it may become a serious cause of infighting. Specific claims may be brought against the Crown Prince and Deputy Minister of Defence Muhammad ibn Salman, who is the leader of the "party of war", which also includes Foreign Minister KSA. In addition, the Kingdom of the budget for 2015 was imposed on the basis of prices of 90 dollars per barrel. But Riyadh has decided to acquire new oil markets, undermine the economy of Russia in revenge for Syria by the sharp relief of world oil prices, and even oust the US shale market companies. As a result, the price per barrel fell to 45-50 dollars. Because of this, Saudi Arabia has to rapidly spend its currency reserves. A tensile strength of Saudi Arabia is quite limited. If the August 2014 currency reserves amounted to $ 737 billion. USD., Now they barely exceed 500 billion. According to IMF estimates, the budget deficit in 2015 will amount to 107 billion. Yes, and the Saudi population is growing rapidly. If in 2010 it amounted to about 29 million people, now - 37 million. Since the economic model of the country remains largely paternalistic, most of the inhabitants of the kingdom somehow dependent on government payments. And the money in the budget is getting smaller. And then there's the recently marred the pilgrimage to Mecca once two tragedies. Falling crane on Al-Haram killed more than 100 people, and then in a stampede during a procession in the valley of Mina as part of Satan ritual pobivaniya stones killed at least 769 believers. According to unofficial reports, the death toll could reach thousands. As a result, the Saudi regime has undergone an unprecedented wave of criticism. The author of a letter calling for the overthrow of the king drew attention to the fact that the very structure of the state is completely rotten and do not meet modern requirements. As an example, he cites including mass death of pilgrims during the last Hajj. And here is very important purely Saudi particular moment: the king of Saudi Arabia bears the title "Custodian of the Two Holy Mosques of Mecca and Medina." This title gives him legitimacy in the eyes of its own population, because the Qur'an is the constitution, says nothing about Saudi Arabia, nor about the monarchy as such (except there were more than four thousand years ago, the Caliphate). So, if the "Guardian" can not perform its first and main mission - to keep the shrine and secure them to the Hajj, its legitimacy is lost. In Saudi Arabia, it is a very serious factor. The recent tragedy in Mecca and Mina have dealt a serious blow to the legitimacy of the king. With the new force began the calls that for the sake of preserving the unity of the Islamic Ummah (the family) and the restoration of historical and social justice need to "remove" two major shrines of Islam in Mecca and Medina of conduct Saudi King and pass them to the management of all the Muslims of the world. Many issues and to how to construct the foreign policy of the kingdom under the current leaders. Mohammed - the young son of the king, behaves inappropriately. He never lived abroad, it has no military education but specifies the foreign and defense policy. But he has a reputation for staunch religious fanatic than explain his actions in Yemen. He began fiercely bombed the country from the air, causing the deaths of thousands of civilians have.The official goal - to punish the "heretics": Shiite Huthis who took power in Yemen last year. The only problem is that the clear purpose have no war, and no exit strategy for Saudi Arabia from it. The war, initially very popular with the former subjects Salman now makes them all the more questions. And then there was the growth of hostility to Iran. Relationship Riyadh and Tehran, and so were sharpened against the background of negotiations to curb Tehran's nuclear program. The fact of death during the Hajj of a large number of Iranians (464 pers. ), Served as an additional stimulus. Ayatollah Khamenei said that the Saudi government may face a "hard and violent reaction" if they "do not show the slightest respect for Iranian pilgrims." Iranian President Hassan Rouhani during the burial of the victims of the stampede in Mina said that Iran will not forgive Saudi Arabia blood of its citizens. According to the secretary of the Supreme National Security Council of Iran, Ali Shamkhani, after the "Islamic state" has caused the greatest harm to Islam is Saudi Arabia. Relations between Saudi Arabia and Iran are so strained that recently prosaudovskie Bahraini authorities to please the boss from Saudi Arabia, publicly withdrew its ambassador from Tehran and the Iranian charge d'Bahrain was declared persona non grata. And of course, Syria. The last few weeks have shown the world the power of the Russian-Iranian military coalition to keep the government of Bashar Assad. Iran allegedly sent hundreds of troops to Syria to assist in carrying out a ground operation and to return the Syrian territory under the control of armed groups, supported by Saudi Arabia. Moscow also sent a powerful grouping of the Air Force. Russia's intervention in the Syrian conflict is a threat to the stability of the Saudi regime, as the US abandoning its traditional role as a guarantor of stability in the Middle East. After a rapid decline of American influence in the region will inevitably increase the vulnerability of the kingdom. 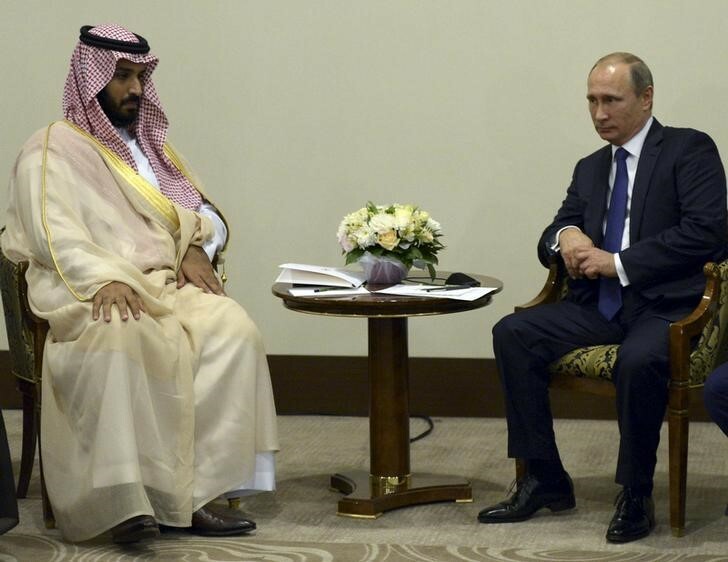 So Muhammad bin Salman rushed in Sochi Vladimir Putin on October 10 How and before that practiced Prince Bandar, the defense minister CSA tried to "buy" the Russian government promises to buy weapons and invest billions in the waning Russian economy. You would think that 10-15 bln. Dollars. Russia can compensate for the fall in oil prices from 105 to 45 dollars. Per barrel, which the Saudis themselves and staged? Moreover, Saudi Arabia is trying to get Russia to cease attacks on Syria by a decline in prices in the oil market. According to the publication Bloomberg, a few days ago, Saudi Arabia has increased its oil prices on to consumers in Asia and the US. Official selling price Medium grade reduced by $ 1.9 dollars. Discount for buyers in November increased from $ 1.3 to $ 3.2 - the highest since 2012, the year when Saudi Aramco introduced the practice of discounts for certain groups of consumers. The official price of Arab Light grade for Asian consumers has been reduced by $ 1.7. Reduced price was the highest since January. Especially for customers from the United States the cost of a barrel of all major varieties of oil have been reduced by 30 cents. Thus, the price of Saudi oil is now far below the most common regional brands of oil in Asia, the US and Europe. In fact, the Saudi authorities have once again decided to use the strategy of dumping, despite the rapidly disappearing foreign exchange reserves. Experts believe that such strict measures Saudis forced Russia's actions in the Middle East region. And on the eve of Sochi, October 9, Saudi Arabia demanded that Russia stop air strikes on Syrian territory, which, according to Riyadh, directed against the Syrian opposition - Sunni fighters who support the kingdom.Saudi Arabia remains in a hostile environment. The Middle East is crumbling, the "Arab Spring" has long passed into the "Islamist winter." And the alliance of Russia - Iran - Syria - Iraq is gaining strength at the borders of the kingdom, through which just about can run flows of militants LIH. The author of the letter circulated in the United Kingdom argues that all these problems in a complex cause not just a concern, but the real murmurs among princes, and among tribal leaders, and even among the ordinary people. However, no methods to influence the current government is not - she lives and works in an impermeable "cocoon." Several previously influential princes, fully suspended from the Minister Salman and his close relatives in the near future are going to consult on ways to solve the problem, which will be discussed and a coup. In Riyadh, the scandal does not comment. Now all the forces thrown in search of the security services disgruntled home. The conspirators will be extremely difficult to implement his plan. Whatever the end of the story, the fundamental problems of the kingdom palace coup would not solve. Democratization, liberalization and the shift away from total control in social, political and everyday life in KSA - that's what you need to the Middle East. And it will not happen as a result of the replacement of some decrepit old men Al Saud family in the other, and a complete regime change or collapse of the kingdom. Apparently, the prince a letter in the British press - is a reflection of what it wants in the West, but not in the region.